The Indian Ocean is lovely and warm. Wind whipping across the sand makes it not quite as enjoyable. I went to St Lucia for one night only, on the way to Durban, with 4 other PC volunteers. We ate lots of delicious food, walked on the beach, and took showers! The next day we all drove to Durban, a huge city and port on the Indian Ocean. I met up there with Carolyn and Catherine, two wonderful “older” volunteers, in a lovely flat, where we spent the night. We spent the morning at the botanical gardens, a short walk from our flat. It was lovely there. I showed the horticulturist a photo of my “mystery” flower from Tembe Elephant Park and he said he would do the research and get back to me about what it was. The three of us flew to Cape Town from King Shaka International Airport. Although the morning had been bright, hot and sunny, by afternoon an electric rain storm was raging. We sat in the plane at the gate for an hour getting periodic updates from the captain. Then, for some bizarre reason, the plane was given permission to take off–a break in the pattern–and we quickly got out of there through wind, rain, thunder, and lightning. The plane rattled and shook and Carolyn held my hand while I not so quietly freaked out. Once we were above the clouds, all went well on the two hour flight across a varied and beautiful country. 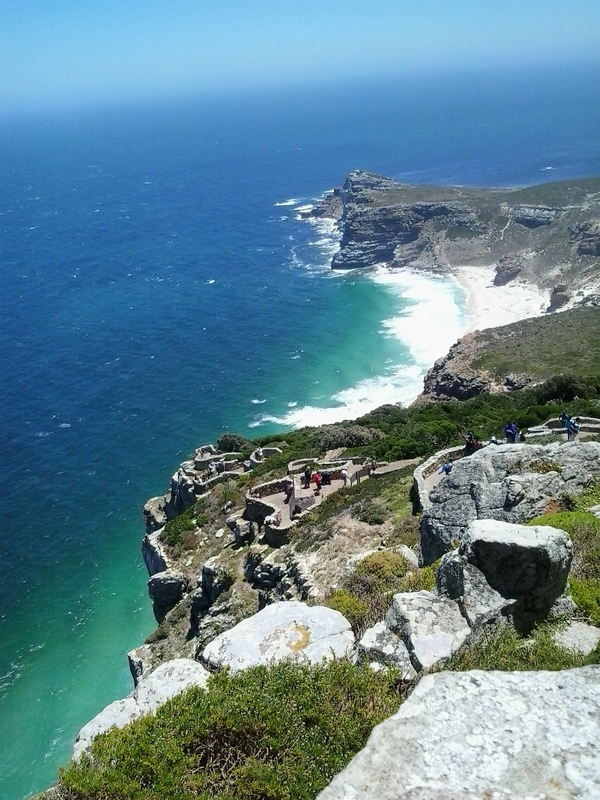 Cape Town is a lovely city on Table Bay on the Atlantic Ocean. It is modern and wealthy and just like any beautiful city in America (think San Francisco). Well, not quite as spectacular as San Francisco. 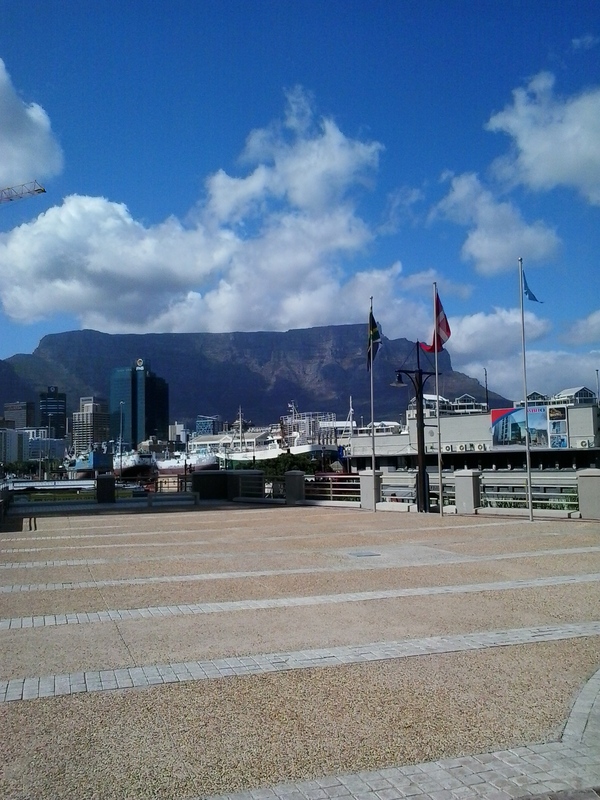 It has a massive mountain (Table Mountain) in its panorama, often covered in clouds, like a tablecloth. There are a lot of tourists from around the world and from other areas of South Africa. You can hear some of the 11 official languages of South Africa (identifying them is another matter) and many others. Our first day was spent on the Hop On-Hop Off bus, with two offs: Kirstenbosch National Botanical Garden and Camps Bay (a beach with white sand on the Atlantic coast). At the botanical gardens, I saw the “mystery” plant and it was labeled as “balloon milkweed” (gomphocarpus physocarpus). Just as I found it, I had a Whatsapp from the Durban horticulturalist informing me what it was! The botanical gardens are exceptionally lovely. On December 26, we took the boat 12 km across the ocean to Robben Island, a small, isolated spot where successive governments have isolated (lepers) and imprisoned (criminals and political dissidents) human beings. Most notably, it was where Nelson Mandela and other anti-apartheid activists were kept for a very long time in very harsh conditions. It is now a World Heritage site. It is a testament to human resilience in the face of wretched treatment. The tour takes visitors to the limestone quarry where the black men worked crushing rock (no white prisoners and no women prisoners were incarcerated here). The tour shows the village area where wardens used to live but now houses site workers and in the end, takes visitors to the cell block where political prisoners were housed. Former inmates are the guides. 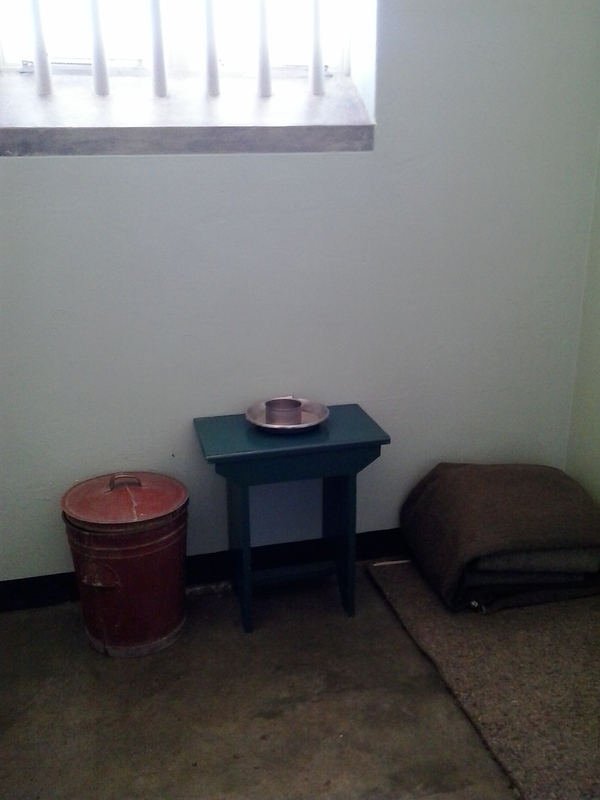 Visitors are shown Mandela’s cell. December 31 was Catherine’s birthday. She thought that would be a perfect day to go to the Cape of Good Hope and so we booked an all-day peninsula tour that included the opportunity to climb a steep path to the non-functional lighthouse at Cape Point and tromp along the rocks at Cape of Good Hope. It was here that the first European, Bartholomeu Dias of Portugal, sailed around the point (but didn’t land) in 1488. Different from his scary experience at the “Cape of Storms,” we had a very windy, sunny and gorgeous day at the most south-western point on the African continent. It was literally crawling with tourists from all over the world, probably including someone from Portugal. 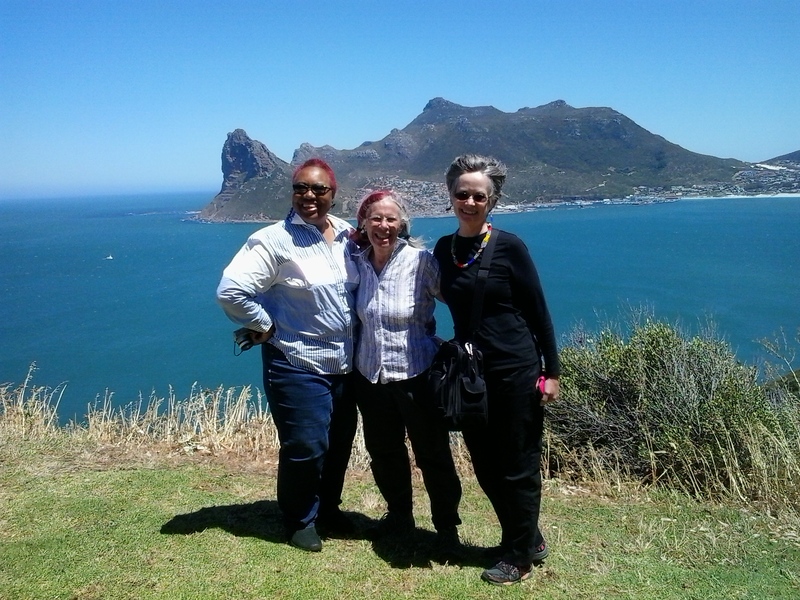 We have spent time touring the Cape Town area and time relaxing at Villa Garda, our B&B in Mowbray, a suburb of Cape Town. We have talked, played Scrabble, gone to a mall to shop (not my favorite thing), eaten in restaurants, taken showers, read books, bought school/teaching supplies, ridden in van taxis just like in KZN (R6 into Cape Town), viewed thousands/millions of African crafts/souvenirs and wondered if they were really made in China. I keep thinking of the children who attend Okhayeni and how little they know about this world I am in now and how big a hurdle it will be if they are someday able to leave deep rural life and enter first world life. Most of them do not know how to eat with a knife and fork. They are adept at eating with their fingers and a spoon. There is so much we just know because it has always been our way of life but for these children/young people who leave rural life and Zulu culture, the learning curve will be steep and challenging. I haven’t seen a cow or a goat or a chicken or a peacock or a pig since leaving my site. They are not in the road here. I have not been able to find herb teas yet or a place that sells a variety of seeds to plant in my “still-in-the-future” garden. I bought a 6-hole muffin tin with the intention of baking muffins in my stoven for the first time. I bought some new jeans and right outside of the mall there was a woman who had an “alterations” booth. I left my new jeans with her and she did a fabulous job of shortening and hemming them for R45.